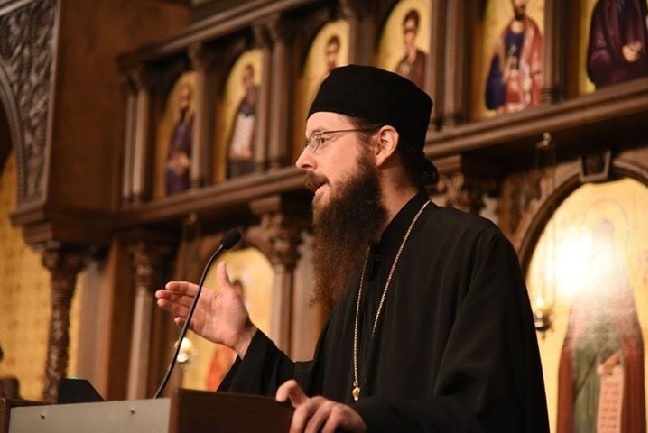 During the 6th Plenary Session of the 18th All-American Council of the Orthodox Church in America, Archimandrite Sergius, the abbot of St. Tikhon's Monastery in Waymart, PA addressed the delegates concerning monasticism and its role in the contemporary American Church. His address is of interest to all the faithful for as he noted both monastics and married laity are "called to live 100% for our Lord 100% of the time," and the monastic life has traditionally been accepted as the inspiration for the laity. As St. John of Climacus wrote: "Angels are a light to monks, and the monastic life is a light to men." The health of the Church in a particular area can be measured by the health of monasticism in that area, and thus the relation of monastic life to the greater Orthodox Church in America is one that concerns all the faithful. In his practical talk Fr. Sergius gives three points for encouraging the growth of Orthodox monasticism in America which, like the Orthodox Church in general, is small in comparison to other 'churches.' The first and most important point is to "Never disdain or discourage any vocation" to monasticism, the priesthood or any clerical office. To do so will hinder the call of God in that person's life. Archimandrite Sergius secondly encourages pilgrimages to monasteries to benefit from the spiritual atmosphere there and, finally, to be inspired by the example of prayer that monasteries set for the Church. Monasticism effects the entire Church: "We, as members of Christ’s body, can and must support the building and growth of monasteries and monastic vocations. By so doing, we invest in the well-being and preservation of the Church as well as in the “churching” of America. Through the monasteries, organic Orthodox life will grow and flourish, and acting like a catalyst, it will empower and inspire local parishioners to give more of their own hearts and lives to God and to prayer. The power that emanates from a monastery is not only real and tangible, it is intensely powerful, life-creating and life-changing." My name is Fr. Archimandrite Sergius and I am the sixteenth Abbot of St. Tikhon’s, America’s oldest Orthodox Monastery founded by St. Tikhon of Moscow in 1905. His Beatitude Metropolitan Tikhon appointed me to this position in the fall of 2008 and since then we have seen many positive changes in the life of the Church and Monastery. I have been a monastic for almost seventeen years and in my current position for nearly seven and I must say restoring St. Tikhon’s Monastery has been one of the most difficult challenges I have ever had in my entire life nor could I have ever imagined how hard it would be but by the grace of God we currently have fifteen fathers and brothers at the Monastery and our life is good in the Lord. Together in cooperation with our benefactors, we have renovated and repaired all of the buildings and structures on the Monastery grounds which currently has three fully functioning Churches, an icon studio, a wood shop, ten beds for guests, a museum of Orthodox history in America (maybe the only one of its kind), a bookstore that is doing well with its publications, iconography projects at Churches, Monastery wine and candles, etc., a wonderful relationship with the Seminary continuing to help to prepare priests for the Church, and a full liturgical cycle where Vespers, Matins, Midnight office, hours and Liturgy are served every day. Thanks to God, the hard work of the monastics, and two benefactors in a short time from now we will have paid down our inherited $1.4 million mortgage down to an amount of currently approximately $650,000. God has been very good to us but the way has been very rough and your support is imperative because the truth is that a healthy, strong St. Tikhon’s Monastery will help to influence and provide a context for a healthy National Orthodox Church in America. I ask you a simple question now. Do you enjoy and sense the peace, blessing and love that are given to you in the person of my Bishop and confessor, Metropolitan Tikhon? Do you sense that God is with us in a real way now in his leadership and his person? I believe that the answer to the above is yes and I offer for your consideration that he is a direct product of St. Tikhon’s Monastery and that starting as a simple novice, history will show you that he is the first Metropolitan of this Orthodox Church in America that began as a lowly novice cleaning sinks, toilets, cooking, directing, and serving in whatever capacity he was asked … just as he serves in that same humble way now. I offer to you the product of a life of prayer, humility and of our Church’s Monastery, the Monastery of St. Tikhon of Zadonsk. There is only one Lord, one Gospel, and one way for all of us that leads to the kingdom. The task for all of us is to continue to put God in the very first place of our heart and life. Again and again, day by day, moment by moment, we are all called, both monastic and married, to live with an uncompromising commitment to the Lord and His Gospel and to carry the Cross that God has given to us. Is this easy? By no means but with God all things are possible. To me monastic life and married life are not opposed: we both have families, we both have heads of those families and we all need to work out our common salvation in the midst of those families. As a monastic I will never ascribe to understanding the difference between monastic life and married life as us and them but rather always we. Many of you know me well and I consider you with great love to be my family. We have one common life in the Church and we work at that common life of prayer, Liturgy, and service to varying degrees according to our ability. However, we are all called to live 100% for our Lord 100% of the time. Do we fail at this? Certainly. Do we keep trying? Absolutely. "You certainly deceive yourself and are greatly mistaken if you think that there is one set of requirements for the person in the world and another for the monastic. The difference between them is that one is married and the other is not; in all other respects they will have to render the same account, for all people are called to reach the same point: [the full measure of Christ; to become perfect as the Father in heaven is perfect]. And this is what throws everything into disorder: the idea that only the monk is required to show greater perfection while the rest are allowed to live in laxity. But this is not true!" We all must diligently strive to build the inner temple in which God wishes to dwell. We all must continue to attempt to do everything we can to make our relationship with God the first thing in our life … and this means we need a life of prayer. A devoted and consistent rule of prayer is an imperative necessity for us all if we wish to escape the sin which so easily besets us all. We must all strive to read and reread the words of our Lord in the Gospel every day making them the sole law of our life. Without prayer, we will not and cannot actualize the promises of the Christian life. The state of monasticism in the Church today is small but growing. When I went to the monastery just seventeen years ago there were few choices. Today, these choices continue to grow in spite of various obstacles. Why, might we ask, are there not a lot of strong experienced monastics in the Church today. Similarly, we might ask why there are not more priests to serve the Church. The answer to this mysterious question is that they are a calling not of man nor after man but directly from God Himself. How then to expand the mission of monasticism in the Church today? I offer three points for your consideration. The first is that we should never ever discourage someone from either understanding monasticism or pursuing a potential monastic vocation. I personally leave people absolutely free to make this discovery for themselves because if God is not calling them it will become obvious in time. However, I beg each one of you whether priest or layman: never disdain or discourage any vocation, whether to monasticism, priesthood, or any kind of service in the Church. It is a very personal matter between that person and God. If we don’t understand why someone would want to pursue such a vocation it is better to say little and direct them to someone else who might be able to help them. As we teach in Seminary, it is not about having all the answers but rather knowing where to find them and who to direct people too. The more we understand about monasticism and gain an appreciation for it the better equipped we will be to be a point of encouragement for such a vocation. Secondly, it is important for us and for others to make pilgrimages frequently to monasteries which are oases of spiritual refreshment. Support for monasteries comes not only by sending donations but even more importantly: Come and see! Our modern perspective does little to help us appreciate how important pilgrimages are but once we go we will more than understand the value of such an undertaking. Encourage pilgrimages to monasteries in your Church, taking a day or overnight trip to a nearby monastery. Treat yourself to the therapy that is available for you at the Monastery. Those of you who make this effort will be able to testify that what I am saying is true: it brings life and light to the soul, inspiration and strength to the heart, and hope for us in the Church as we continue to carry the cross of ministry. Third, monasteries remind us just how important prayer is not just for the monks but for every one of us. The Liturgy needs to be served on Sunday for the people but ideally it should be served one day outside that time for the priest’s own personal spiritual wellbeing. We must be deeply committed to the Lord through our internal and external life of prayer: having a regular time of prayer every single day as well as serving Liturgy or other service during the week so that we do not try up hardened in our heart to God’s voice and leading. This life of prayer is the imperative necessity because it joins us in a unity of spirit with the monastics who make this their primary work and provide an icon of the world to come and a light that shines before men. If we want to understand the monastic, we must become men and women of prayer, real prayer, committed prayer, consistent prayer, deep prayer, tearful prayer, holy prayer that quench our parched lips in this God forgetting world. We join together in this prayer every time we enter the Church and the more frequently we attend this school the more we will enter into this mystery of our Life in Christ and understand to some degree our Lord and the reality of His Kingdom. St. Theophan tells us to begin prayer as if we have never prayed. The only real rule of prayer that we must ascribe to is to start again. Everyone must build this Temple for the Lord in their heart. It is the inner vocation of us all. Outwardly we will do different work and be in different circumstances concerning vocation but we will continue to work this work together if we are striving for our salvation. Our prayer must be that we seek the Lord anew today, beseeching Him to help us to begin again on the path of prayer which will lead us to the light of Christ which illumines all. It is obvious that indeed, monastic and married lives are very different, and yet, there is only one model for all: our Lord Jesus Christ. Those who are married cannot pretend to be monastic and those who are in the monastery cannot be live like those who are married. However, both of them can and must commit themselves to be 100% like Christ 100% of the time. Many are called to the married life by God: to live a godly, holy life, raising godly, god-fearing children to be good Orthodox Christians. This calling is from God and it is immensely important in the world in which we live today. Likewise, some will be called to the monastic life, in imitation of the angels, and they will live a life, with the help of God’s grace, which is an image of the world which is to come. In either case, we must be faithful to what God has called us to, which ever it is. The state that is the highest one is the state that we are called by God to live in with all our strength, striving to always remember the Lord and His commandments. There can be no arguing of the success of monasticism. Sainted monastics fill our Church calendars, they line the walls of the Church and have formulated and preserved not only the Church’s doctrine but also the treasury of the Church’s liturgical life. Monastics were even the first to bring Orthodox Christianity to the new world of America in 1794. St. Herman, St. Juvenaly and several other monks were the first to arrive in America on the shores of Alaska from the Valaam monastery to begin the work of spreading the Orthodox Faith in this land. It was this first group of monks, which through prayer and fasting and total commitment to Christ, converted thousands of Alaskan Native people and paved the way for St. Innocent in the 1840’s, to continue working the fields which had been planted and were ripe for the harvest. The monastery sanctifies not only the monastics and those who visit but even the trees, the rocks, and the very ground itself. How often have we heard the expression “holy ground?” And this statement is not unfounded, for we know that the material world, when it comes into contact with Christ’s body, which is the Church, is illumined with grace like Christ’s garments were during the Transfiguration. It is said that this kind of sanctification affects the whole universe, and when saints emerge from these habitations, in an unfathomable and yet real way, they become a catalyst for the salvation of nations and the entire material universe in which they live. May we strive, by the grace of God, no matter the state of our lives, to do the same. I beseech you (if you haven’t already) to open your hearts and make a place for the monastics there and in your parish community. We already have you in our hearts and we hope and pray that you will do the same. May God bless you, be assured of our prayers and pray for us. Forgive me and thank you.